Spina bifida literally means "spine in two parts" or "open spine". 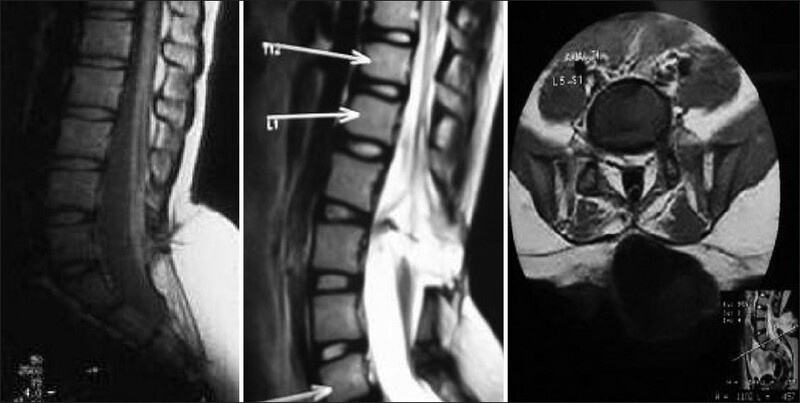 Spinal dysraphism involves a spectrum of congenital anomalies resulting in a defective neural arch through which meninges or neural elements are herniated, leading to a variety of clinical manifestations. , They are divided into aperta (visible lesion) and occulta (with no external lesion). , Meningocele, myelomeningocele, lipomeningomyelocele, myeloschisis and rachischisis are the usual names associated depending on the pathological findings. Meningocele by definition involves only the meninges with no neural involvement; others have variable extent of neural involvement. 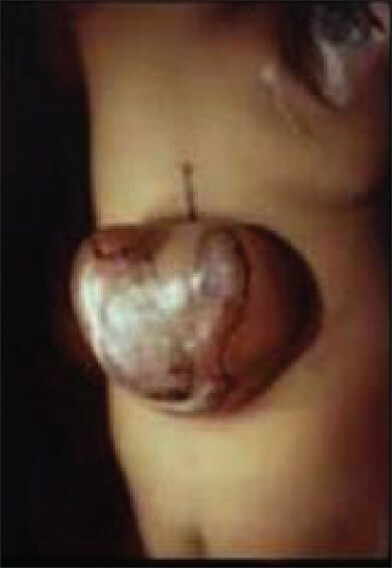 The spina bifida aperta is usually associated with skin defect with an impending risk of CSF leak constituting "open defects," whereas the occult forms have normal skin cover. Both forms demand different approaches in their management. The clinical importance of occult lesion has grown tremendously in the recent years. The number of children suffering from spina bifida and hydrocephalus was large though the detection was sporadic by the pediatricians in the past. With the awareness and growth of neurosurgery in the country, few referral centers established special clinics with an ability to address these problems. Gradually, with the availability of magnetic resonance imaging (MRI), several such anomalies were identified, especially of the occult variety. This also helped to visualize a variety of underlying anomalies and their clinical consequences. After pediatric neurosurgery became a subspeciality, several neurosurgeons took interest in this field and contributed in early detection and treatment and also with several good publications. The number of centers has increased across the country. Several unusual anomalies and rare anomalies have been detected and published. Meanwhile, there has been a steady decline in these anomalies over the last decade. Prenatal diagnosis and the medical termination of pregnancy as well as folic acid fortification have contributed. As a result, the anomalies which are not compatible with life and severe anomalies with major defects have reduced, leading to social comfort. Prenatal diagnosis and genetic analysis has become a routine across the country. Few specialized centers have involved in clinical genetics and metabolic workup of these children, contributing to the etiology of many developmental and metabolic diseases. Hence, there has been a shift from open lesion to greater detection and treatment of occult lesions. Considering the size and numbers in the country, a lot needs to be done to provide uniform standards of care in all centers. But it is a happy moment to all of us that several neurosurgeons are practicing pediatrics as their special interest and many are becoming dedicated pediatric neurosurgeons, thanks to ISPN CME Programs for educating neurosurgeons across the country. This phenomenal change and specialization has become a reality by such educational programs. The estimated incidence of spinal dysraphism is about 1-3/1000 live births. The prevalence of spinal dysraphism has been in decline the world over in the last few decades due to the better nutrition for women, folic acid supplementation, improved antenatal care and high-resolution ultrasound for prenatal screening and biochemical markers. Failure of primary neurulation leads to open dysraphism posing the risks of CSF leakage and exposure of neural placode. Extent and severity of neurological deficit depends on the degree of malformation of the neural placode and also the level of the defect. The higher the level, usually worse is the prognosis. A spectrum of neurological abnormalities like hydrocephalus, Chiari malformation More Details, syrinx, gyral malformations, skeletal malformations and uro-vesical defects can be associated. In occult dysraphism, the overlying skin is intact but the spinal cord is anchored to various tissues starting from skin, subcutaneous tissue, adipose tissue or cartilage. Spina bifida has a multifactorial causation, involving both genetic and environmental. Recent information stressed on the importance of maternal nutrition and folic acid supplementation which has contributed to its reduction. , In India, certain regional factors and consanguinity seem to play a role [hospital-based epidemiological study from NIMHANS (unpublished)]. 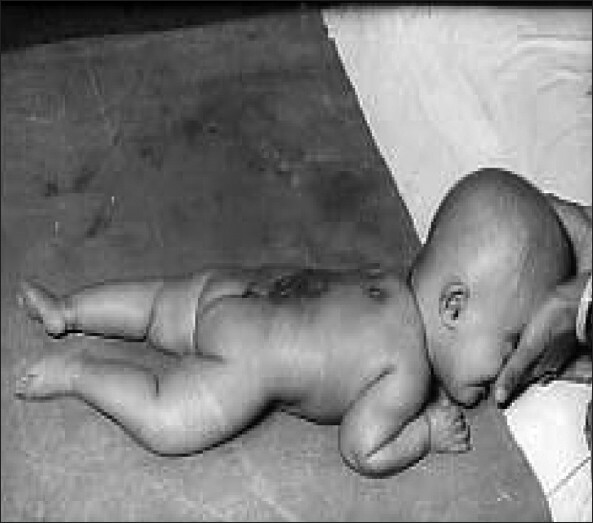 Open dysraphism presents with a swelling over the back which is noticed at birth [Figure 1]. Symptoms are primarily referable to CSF leak or the exposed spinal cord. Since the skin over the swelling is poorly developed, it usually gives way during labor, resulting in CSF leak, contamination and meningitis. Defects predominantly involve thoracolumbar, lumbosacral, lumbar, thoracic, sacral and cervical in the order of frequency of occurrence. Incidence of high cervical lesions is about 3.9%. Neurological deficits include motor, sensory and sphincter dysfunction, depending upon the severity and level. In severe cases, hypotonic areflexic limbs, sphincter atonia with rectal prolapse may be associated. Chiari malformation presents with lower brainstem and lower cranial nerve dysfunction. The presence of large head usually indicates hydrocephalus. The associated skeletal abnormalities are kyphosis, scoliosis, and deformities of the long bones and feet, hemivertebrae, defective ribs, etc. Initial assessment of the newborn is extremely important, preferably both by a pediatrician and a neurosurgeon. Examination of head and neck involves the assessment of head size, shape, skull bones, and openness of fontanelles, lacunar skull defects and the size of the posterior fossa. Examination of the back needs assessment of the neural placode, level of the lesion, condition of the skin, extent of skin defect and associated deformities. Examination of the lower limbs for detection of the deformities of the foot and abnormalities of long bones is important. A detailed neurological examination is necessary to assess the level of motor weakness, sensory level and sphincter dysfunction. Timing of intervention primarily depends on the clinical condition of the child and the impending risks. Surgery need not be done as a compelling emergency but should be undertaken as soon as it is practical. In case of suspected meningitis or CSF infection or colonization of the wound, prophylactic antibiotics and anticonvulsants form the initial treatment. Child is nursed in an incubator; routine blood counts and serum electrolytes are monitored. Blood grouping and cross matching is done for possible transfusion. Careful assessment of body weight is essential for intraoperative management. The newborn child with myelomeningocele should have saline dressings. It is essential not to use corrosive agents, spirit or antiseptics indiscriminately over the open defects to avoid damage to the underlying exposed neural tissue. To obtain successful repair, it is essential to study the surface anatomy and its relationships to the surrounding structures. At the apex of the myelomeningocele usually, the flat neural placode is located and from its edge the remnants of the arachnoid membrane get attached at the nerve root entry zone. From this junction, the nerve roots emerge and exit through neural foramina located ventrally. They are seen through the transparent arachnoid membrane which is fused with the skin at the lateral edges of the lesion. The dura matter which is defective posteriorly is loosely adherent to the underlying soft tissue of the back and densely adherent to the bony structures underneath. Rostrally, the dura forms tube and the neural placode continues into it, which leads to functional spinal cord. Anatomical in which the conus is placed at a lower level than the normal. Physiological due to tight or thick filum. In this variety, the conus may be at normal level, but the movement of spinal cord is restrained resulting in neurological deficits and vesicle dysfunction called "neurogenic nonneurogenic bladder." Developmental in which it could be secondary to a variety of conditions like congenital anomalies, terminal lipoma, intraspinal lipoma, lipomyelomeningocele, split cord malformations, sacral agenesis and other occult dysraphic states. The predominant symptoms can be motor in the form of insidiously progressive distal weakness and spasticity, and sensory ones like sensory loss, paresthesias and trophic ulcers. Neurovesical dysfunction is one of the commonest presentations, ranging from a minor bladder disturbance to frank urinary incontinence, occasionally associated with bowel movement dysfunction. At times, pain can be the major symptom. Pain may be radicular or funicular, low back or calf muscle pain. The scoliosis due to tethering is a much debated issue, but with enough evidence to suggest its role. A detailed neurological assessment is mandatory. Neurocutaneous markers, like tuft of hair, nevous, dysplastic skin, angiomatous patches, lipoma, dermal sinus, presence of human tail and absence of gluteal folds, can be the strong indicators [Figure 5], [Figure 6], [Figure 7], [Figure 8] and [Figure 9]. Neurovesical dysfunction, leg pain, scoliosis, and motor or sensory deficits should prompt the clinician to look for possible tethering even in the absence of cutaneous markers. With tethering being a congenital phenomenon, these children often present to their pediatricians with vague leg pains, to orthopedicians with gait disturbance and deformities, to urologists with bladder symptoms like frequent persistent bed wetting, and finally to neurosurgeons when the neurological deficits become overt. Hence, awareness about the recent developments among the medical fraternity is necessary. The name tethered cord implies that the spinal cord is attached tightly to a congenitally abnormal structure in the lumbosacral area, as well as at the craniovertebral junction. With growth, the spinal cord is stretched between these two points, resulting in insidious and progressive neurological deterioration. The popular belief that the deterioration occurs mostly during the phases of rapid growth is not confounded. During embryonic life, the spinal cord lies way down at sacral segments, and gradually the conus ascends and reaches the adult level at the time of birth, as confirmed by ultrasonographic studies. In this pathological situation, the spinal cord is tethered to anatomical structures lower down, preventing the ascent of the conus in parallel to the vertebral growth. On the other hand, there is disproportionate growth between the spine and the spinal cord, resulting in progressive traction. Normally, when a child bends forward, there is an ascent of the spinal cord by one to two segments. The filum can be short and thick, with anatomically variant fibroelastic fibrous tissue, making it tight and preventing such movement. Progressive neurological deterioration in terms of motor, sensory or urinary dysfunction in a child is a clear indication. Pain, spasticity, gait abnormality, and persistent or progressive scoliosis are the other indications. Knowing the mechanisms of neurological deterioration, prophylactic surgery is logical. If the neurological deficit has already occurred, surgery should be done as soon as the diagnosis is established. Proper dural reconstruction with adequate CSF space around the spinal cord to prevent retethering. A theoretical risk of retethering exists after the treatment of any tethered cord or some of these complex anomalies. Every known precaution should be adopted to prevent such a possibility. This includes complete untethering of all the contributory structures, proper concealing of rough and possible adhesive surfaces by pial sutures, laminectomy to accommodate thickened cord and to facilitate upward movement, duraplasty to create a reservoir of CSF around the repaired structures and epidural fat grafts to prevent fibrosis. Some studies reported advantage of nursing the child in prone position postoperatively. Avoid intradural lumbar drains as far as possible. During follow-up, subtle neurological worsening or progression of deformities should be looked for. MRI should be repeated at the earliest suspicion. At present, there is no foolproof investigation to demonstrate retethering. 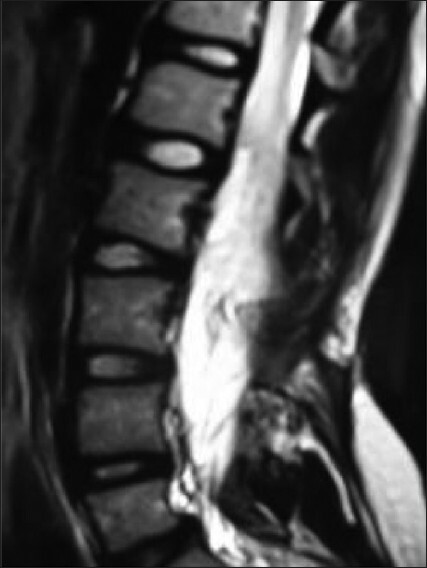 MRI in prone position to demonstrate CSF dorsal to the conus has been suggested. Serial electrophysiological and urodynamic studies seem to be indicative. Till such time, clinical diagnosis remains the gold standard. All symptomatic children due to suspected retethering should be reoperated to prevent further deterioration. But surgery on pure radiological suspicion for retethering is controversial [Figure 12]. Anatomical features like size of the lipoma, location (midline or paramedian), wide bony defect, defective muscles and fascia, poor cleavage at neurolipomatus junction. Physiological factors like degree of traction, ability of cord to withstand the effects of traction. Dorsal variety lipomas enter into the segment of spinal cord dorsally through fibrofatty pedicle, below which normal cord and dura exists. Transitional variety is essentially a dorsal type which covers the entire conus and extends up to the filum. Distally, no normal cord exists, whereas in terminal variety the normal looking conus ends into lipoma through a dural defect and all the sacral roots are cranial to the lipoma. Broad principles include vertical skin incision, dissection of subcutaneous lipoma up to the fascia, excision of extraspinal component of lipoma, identification of upper and lower laminae and performing laminectomy, identification of normal dura above and below and separation of dural tube from the thoracolumbar fascia all around. These are followed by dural opening (circumferential) around the fibrofatty stalk, removal of intradural lipoma, gentle dissection of fibrofatty pedicle up to the neural structures over the dorsal surface of cord and removal of fibrous tissue up to the neuro fibrolipomatous junction, removal of other fibrous bands and finally detachment of filum. 1. Harwood-Nash DC, McHugh K. Diastematomyelia in 172 children: The impact of modern neuroradiology. Pediatr Neurosurg 1991;16:247-51. 2. De Jong TP, Boemers TM, Schouten A, van Gool JD, de Maat-BleekerF, Bruijnzeel-Koomen CA. Peroperative anaphylactic reactions due to latex allergy. Ned Tijdschr Geneeskd 1993;137:1934-6. 3. Morrow JD, Kelsey K. Folic acid for prevention of neural tube defects: Pediatric anticipatory guidance. J Pediatr Health Care 1998;12:55-9. 4. Pal-de Bruin KM, Buitendijk SE, Hirasing RA, den Ouden AL. Prevalence of neural tube defects in births before and after promotion of periconceptional folic acid supplementation. Ned Tijdschr Geneeskd 2000;144:1732-6. 5. Steinbok P. Dysraphic lesions of the cervical spinal cord. Neurosurg Clin N Am 1995;6:367-76. 6. Boyd PA, Wellesley DG, De Walle HE, Tenconi R, Garcia-Minaur S, Zandwijken GR, et al. Evaluation of the prenatal diagnosis of neural tube defects by fetal ultrasonographic examination in different centers across Europe. J Med Screen 2000;7:169-74. 7. Candenas M, Villa R, Fernandez Collar R, Moina MJ, Pintado S, Garcia Saez F, et al. Maternal serum alpha-fetoprotein screening for neural tube defects. Report of a program with more than 30,000 screened pregnancies. Acta Obstet Gynecol Scand 1995;74:266-9. 8. Anderson NG, Jordan S, MacFaelane MR, Lovell-Smith M. Diastematomyelia: Diagnosis by prenatal sonography. AJR Am J Roentgenol 1994;163:911-4. 9. Chan A, Robertson EF, Haan EA, Ranieri E, Keane RJ. The sensitivity of ultrasound and serum alpha-fetoprotein in population-based antenatal screening for neural tue defects. South Australia 1986-1991. Br J Obstet Gynaecol 1995;102:370-6. 10. Chitty LS. Ultrasound screening for fetal abnormalities. Prenat Diagn 1995;15:1241-57. 11. Malinger G, Lerman-Sagie T, Watemberg N, Rotmensch S, LevD, Glezerman M. A normal second-trimester ultrasound does not exclude intracranial structural pathology. Ultrasound Obstet Gynecol 2002;20:51-4. 12. Pierre-Kahn A, Hanlo P, Sonigo P, Parisot D, McConnell RS. The contribution of prenatal diagnosis to the understanding of malformative intracranial cysts: State of the art. Childs Nerv Syst 2000;16:619-26. 13. Vintzileos AM, Ananth CV, Fisher AJ, Smulian JC, Day-Salvatore D, Beazoglou T, et al. Cost-benefit analysis of targeted ultrasonography for prenatal detection of spina bifida in patients with an elevated concentration of second-trimester maternal serum alpha-fetoprotein. Am J Obstet Gynecol 1999;180:1227-33. 14. Brunberg JA, Latchaw RE, Kanal E, Burk DL Jr, Albright L. Magnetic resonance imaging of spinal dysraphism. Radiol Clin North Am 1988;26:181-205. 15. Gupta RK, Sharma A, Jena A, Tyagi G, Prakash B, Khushu S. Magnetic resonance evaluation of spinal dysraphism in children. Childs Nerv Syst 1990;6:161-5. 16. Charney EB, Weller SC, Sutton LN, Bruce DA, Schut LB. Management of the newborn with myelomeningocele: Time for a decision-making process. Pediatrics 1985;75:58-64. 17. Johnson MP, Gerdes M, Rintoul N, Pasquariello P, Melchionni J, Sutton LN, et al. Maternal-fetal surgery for myelomeningocele: Neurodevelopmental outcomes at 2 years of age. Am J Obstet Gynecol 2006;194:1145-50; discussion 1150-2. 18. Pang D. Total and near-total resection of spinal cord lipoma. 1st China ISPN Course on Pediatric Neurosurgery, Hong Kong, August 2005. 19. Reigel DH. Kyphectomy and Myelomeningocele repair. In Modern Technique in Surgery. Mount Kisco, NY: Futura; 1979. 20. Venkataramana NK, Anantheshwar YN. Tissue expansion technique for closure of myelomeningocele. J Pediatr Neurosci 2009;4:25-9. 21. Abrahamsson K, Arnell Vu-Minh M, Jodal U, Lindehall B, Sillen U, Sixt R. Evaluation of renal function in children with myelodysplasia. Br J Urol 2004;93 Suppl 2:26-7. 22. Barry BP, Hall N, Cornford E, Rose DH. Improved ultrasound detection of renal scarring in children following urinary tract infection. Clin Radiol 1998;53:747-51. 23. Bauer SB, Colodny AH, Retik AB. The management of vesicoureteral reflux in children with myelodysplasia. J Urol 1982;128:102-5. 24. Capitanucci ML, Iacobelli BD, Silveri M, Mosiello G, De Gennaro M. Long-term urological follow-up of occult spinal dysraphism in children. Eur J Pediatr Surg 1996;6 Suppl 1:25-6. 25. Gordon I. Vesico-ureteric reflux, urinary-tract infection, and renal damage in children. Lancet 1995;346:489-90. 26. Greig JD, Young DG, Azmy AF. Follow-up of spina bifida children with and without upper renal tract changes at birth. Eur J Pediatr Surg 1991;1:5-9. 27. McLone DG. Technique for closure of myelomeningocele. Childs Brain 1980;6:65-73. 28. Muller T, Arbeiter K, Aufricht C. Renal function in myelomeningocele: Risk factors, chronic renal failure, renal replacement therapy and transplantation. Curr Opin Urol 2002;12:479-84. 29. Boop FA, Russell A, Chadduck WN. Diagnosis and management of the tethered cord syndrome. J Ark Med Soc 1992;89:328-31. 30. Jones PH, Love JG. Tight filum terminale. Arch Surg 1956;73:556-66. 31. Yamada S, lacono R, Yamada B. Pathophysiology of the tethered spinal cord. In: Yamada S, editor. Tethered cord syndrome. Park ridge, IL: American Association of Neurological Surgeons; 1996. p. 29-45. 32. Warder DE, Oakes WJ. Tethered cord syndrome- The low-lying and normally positioned conus. Neurosurgery 1994;34:597-600. 33. Warder DE, Oakes WJ. Tethered cord syndrome and the conus in a normal position. Neurosurgery 1993;33:374-8. 34. Chakrabortty S, Oi S, Yoshida Y, Yamada H, Yamaguchi M, Tamaki N, et al. 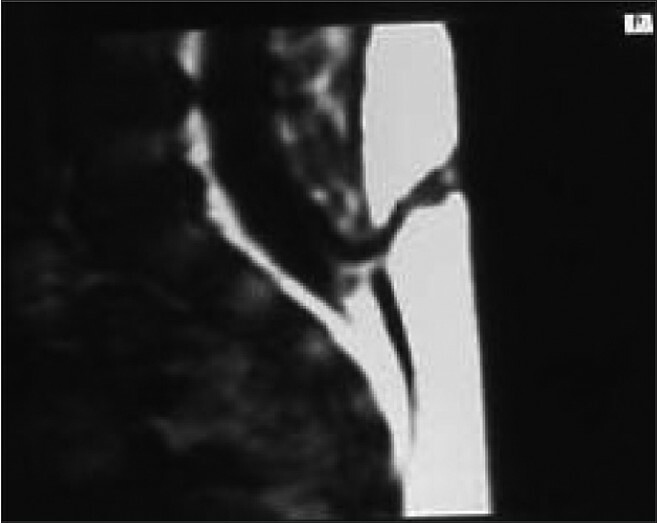 Myelomeningocele and thick filum terminale with tethered cord appearing as a human tail. Case report. J Neurosurg 1993;78:966-9. 35. Pang D, Dias MS, Ahab-Barmada M. Split cord malformation. I.Aunified theory of embryogenesis for double spinal cord malformations. Neurosurgery 1992;31:451-81. 36. Pang D, Wilberger JE Jr. Tethered cord syndrome in adults. J Neurosurg 1982;57:32-47. 37. Pang D. Tethered cord syndrome. Neurosurgery: States of the Arts Review; Vol. 1, 1986. p. 45-79. 38. Schneider S, Rosenthal A, Greenberg B. A prelimnary report on the use of laser-Doppler flowmetry during tethered spinal cord release. Neurosurgery 1993;32:214-7. 39. Breig A. Overstretching of and circumscribed pathological tension in the spinal cord: A basic cause of symptoms in cord disorders. J Biomech 1970;33:7-9. 40. Kang J, Kim King D. Effects of tethering on regional spinal cord blood flow and sensory evoked potentials in growing cats. Childs Nerv Syst 1987;3:35-9. 41. 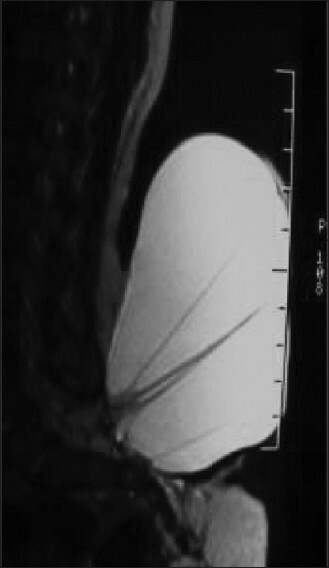 Aoki N. Rapid growth of intraspinal lipoma demonstrated by magnetic resonance imaging. Surg Neurol 1990;34:107-10. 42. Bruce DA, Schut L. Spinal lipomas in infancy and childhood. Childs Brain 1979;5:192-203. 43. Foster LS, Kogan BA, Cogen PH, Edwards MS. Bladder function in patients with lipomyelomeningocele. J Urol 1990;143:984-6. 44. Lellouch-Tubiana A, Zerah M, Catala M, Brousse N, Kahn AP. Congenital intraspinal lipomas: Histological analysis of 234 cases and review of the literature. Pediatr Dev Pathol 1999;2:346-52. 45. Lhowe D, Ehrlich MG, Chapman PH, Zaleske DJ. Congenital intraspinal lipomas: Clinical presentation and response to treatment. J Pediatr Orthop 1987;7:531-7. 46. Venkataramana. Surgery of lumbar lipomeningocele. In text book of operative Neurosurgery. Vol. 2. New Delhi: BI Publications Pvt. Ltd.; 2005. p. 1119-23. 47. Chapman PH. Congenital intraspinal lipomas: Anatomic considerations and surgical treatment. Childs Brain 1982;9:37-47. 48. Xenos C, Sgouros S, Walsh R, Hockley A. Spinal lipomas in children. Pediatr Neurosurg 2000;32:295-307. 49. Cochrane DD, Finley C, Kestle J, Steinbok P. The patterns of late deterioration in patients with transitional lipomyelomeningocele. Eur J Pediatr Surg 2000;10 Suppl 1:13-7. 50. Koyanagi I, Iwasaki Y, Hida K, Abe H, Isu T, Akino M. Surgical treatment supposed natural history of the tethered cord with occult spinal dysraphism. Childs Nerv Syst 1997;13:268-74. 51. Mclone D, Mutluer S, Naidich TP, Alvard EC. Lipomeningoceles of the conus medullaris. Concepts in pediatric neurosurgery. Basel: Krager; 1983. p. 170-7. 52. Pierre-Kahn A, Zerah M, Renier D, Cinalli G, Sainte-Rose C, Lellouch-Tubiana A, et al. Congenital lumbosacral lipomas. Childs Nerv Syst 1997;13:298-334; discussion 335. 53. Van Calenbergh F, Vanvolsem S, Verpoorten C, Lagae L, Casaer P, PletsC. Results after surgery for lumbosacral lipoma: The significance of early and late worsening. Childs Nerv Syst 1999;15:439-42; discussion 443. 54. La Marca F, Grant JA, Tomita T, McLone DG. Spinal lipomas in children: Outcome of 270 procedures. Pediatr Neurosurg 1997;26:8-16. 55. Oakes W. Management of spinal cord lipomas and lipomeningoceles. In: Wilkins RH, Rengachary SS, editors. Neurosurgery Update II. Vol. 3. New York: McGraw-Hill; 1991. p. 3497-504. 56. AQ17Schimidek , Sweet Operative Neurosurgical Techniques Vol2, 5th Edition, 2009, R. Shane tubs and w.Jerry doaker, Page Bo. 2201-2214. 57. Text Book of Pediatric Neurosurgery. Surgery of the developing nervous system. 4th ed. W. B. Saunders Company; 2001. 58. 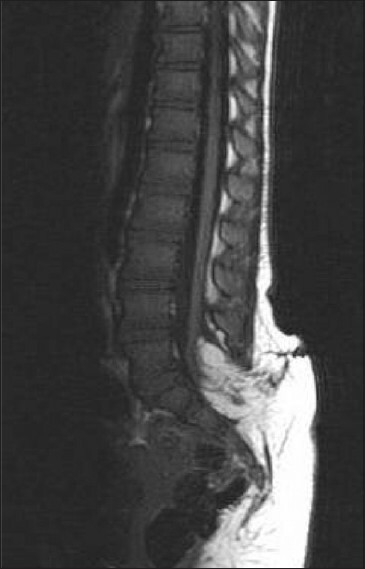 Tse YH, Fong D. Treatment and Outcome Review of Spinal Dysraphism. 11th Annual Scientific Meeting of the Hong Kong Neurosurgical Society, 2004. 59. Venkataramana NK. Tethered cord Syndrome: Progress in clinical Neurosciences. Neurol Soc India2003;18:56-70. 60. Choi S, McComb JG. Long-term outcome of terminal myelocystocele patients. Pediatr Neurosurg 2000;32:86-91. 61. Rickwood AM, Thomas DG. The upper renal tracts in adolescents and young adults with myelomeningocele. Z Kinderchir 1984;39 Suppl 2:104-6. 62. Mclone D, Naidich T. Terminal myelocystocele. Neurosurgery 1985;16:35-41. 63. Peacock WJ, Murovic JA. Magnetic resonance imaging in myelocystoceles. Report of two cases. J Neurosurg 1989;70:804-7. 64. Cheek WR, Laurent JP. Dermal sinus tracts. In: Marlin AE, editor. Concepts in Pediatric Neurosurgery. Basel: S. Krager; 1985. p. 63-75. 65. 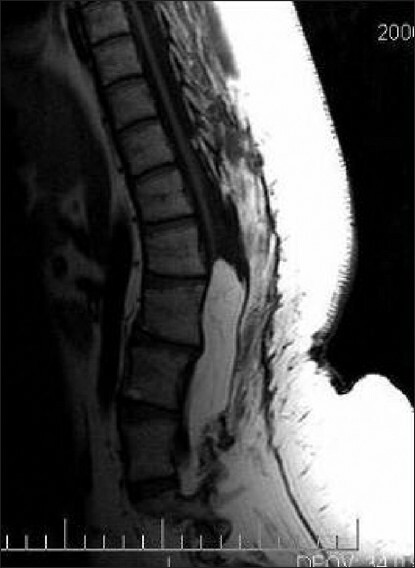 Gindi SE, Fairburn B. Intramedullary spinal abscess as a complication of a congenital dermal sinus. J Neurosurg 1969;30:494-7. 66. Lemire RJ, Loeser JD, Leech RW, et al. Normal and Abnormal development of the Human Nervous System. New York: Harper and Row; 1975. 67. Muraszko K, Youkilis A. Intramedullary spinal tumors of disordered embryogenesis. J Neurooncol 2000;47:271-81. 68. Kanev PM, Park TS. Dermoids and dermal sinus tracts of the spine. Neurosurg Clin N Am 1995;6:359-66. 69. Powell KR, Cherry JD, Hougen TJ, Blinderman EE, Dunn MC. A prospective search for congenital dermal abnormalities of the craniospinal axis. J Pediatr 1975;87:744-50. 70. Venger B, Laurent JL, Cheek WR, et al. Congenital thoracic dermal sinus tracts. In: Marlin AE, editor. Concepts in Pediatric Neurosurgery. Basel: S. Krager; 1989. p. 161-72. 71. Kondo A, Kato K, Kanai S, Sakakibara T. Bladder dysfunction secondary to tethered cord syndrome in adults: Is it curable? J Urol 1986;135:313-6. 72. 81. Selçuki M, Unlü A, Uður HC, Soygür T, Arikan N, Selçuki D. Patients with urinary incontinence often benefit from surgical detethering of tight fulum terminale. Childs Nerv Syst 2000;16:150-5. 73. Kondo A, Kobayashi M, Otani T, Takita T, Mitsuya H. Children with unstable bladder: Clinical and urodynamic observation. J Urol 1983;129:88-91. 74. Caruso R, Cervoni L, Fiorenza F, Vitale AM, Salvati M. Occult dysraphism in adulthood. A series of 24 cases. J Neurosurg Sci 1996;40:221-5. 75. Gupta SK, Khosla VK, Sharma BS, Mathuriya SN, Pathak A, TewariMK. Tethered cord syndrome in adults. Surg Neurol 1999;52:362-70. 76. Kim SK, Chung YS, Wang KC, Cho BK, Choi KS, Han DH. Diastematomyelia. Clinical manifestation and treatment outcome. J Korean Med Sci 1994;9:135-44. 77. McLone DG. The adult with a tethered cord. Clin Neurosurg 1996;43:203-9. 78. Khoury AE, Hendrick EB, McLorie GA, Kulkarni A, Churchill BM. 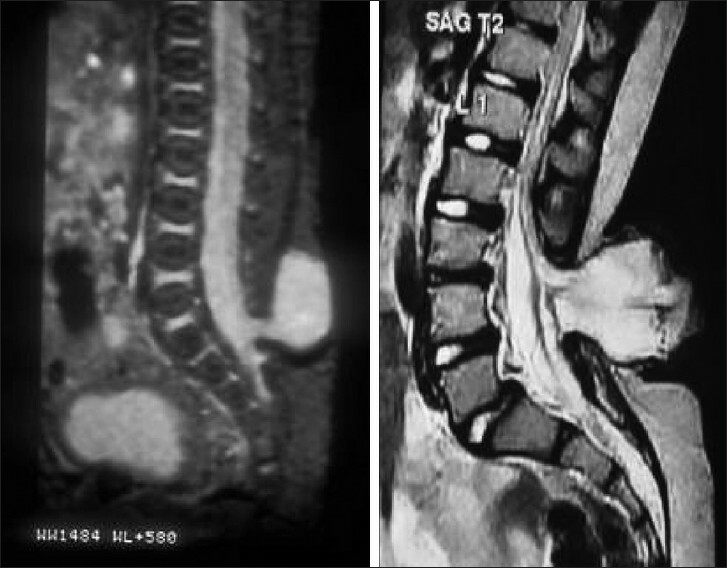 Occult spinal dysraphism: Clinical and urodynamic outcome after division of the filum terminale. J Urol 1990;144:426-8; discussion 428-9, 443-4. 79. Kondo A. Cystourethrograms characteristic of bladder instability in children. Urology 1990;35:242-6. 80. Selcuki M, Coskun K. Management of tight filum terminale syndrome with special emphasis on normal level conus medullaris (NLCM). Surg Neurol 1998;50:318-22.